Seeking to recognize a leading Vermont environmentalist and honor the legacy of a legendary wildlife advocate, Green Mountain Power is calling for nominations for the 2016 GMP-Zetterstrom Environmental Award. Named for the famed osprey advocate Meeri Zetterstrom, the GMP-Zetterstrom Environmental Award is presented annually to one person, business, group or non-profit to honor a significant contribution to Vermont’s environment. It is accompanied by a $2,500 donation to the winner’s environmental cause. Zetterstrom, a cantankerous and passionate wildlife advocate, began what became a statewide initiative to restore endangered ospreys in Vermont in the late 1980s. 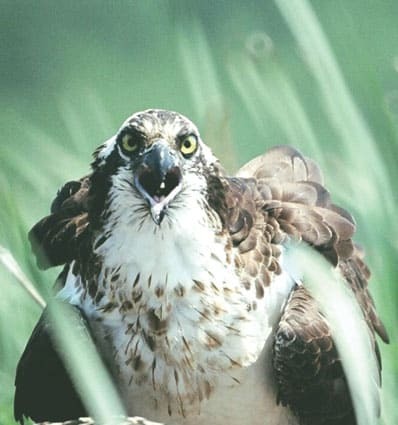 Her vision, collaboration and leadership prompted utilities, the state and private landowners to work together, and ultimately lead to the resurgence of ospreys over the next 20 years. In 2005, shortly before she died, ospreys were removed from the endangered species list, and plans for the Zetterstrom Award began. Zetterstrom lived in a small cabin with a bird’s-eye view of Lake Arrowhead, and was among the first to notice when a couple of ospreys returned to fish the lake’s waters after their near extinction in Vermont in the 1940s. Starting at Zetterstrom’s behest in 1988, artificial nesting platforms, buffer zones and educational materials were used to give the birds a fighting chance at recovery. Past Zetterstrom Award recipients include Sally Laughlin, a leading wildlife advocate and scientist whose work was instrumental in restoring three species of endangered birds in Vermont; Michael Smith, the founder of Rutland’s Pine Hill Park; Margaret Fowle, who led Vermont’s peregrine falcon restoration program; the Lake Champlain Committee, which works to protect and improve Lake Champlain; Kelly Stettner, who founded the Black River Action Team in southern Vermont; and Roy Pilcher, founder of the Rutland County Chapter of Audubon. Nominations for the GMP-Zetterstrom Environmental Award will be accepted through March 15, and the winner announced in the spring. The winner will be chosen by a panel of GMP employees with responsibilities related to land management, resource protection, community relations and education, and environmental compliance. Nominations may be made by the nominee or by any other entity, and should demonstrate a commitment of the nominee to benefit Vermont, its land, air or water, wildlife, or the enjoyment of the outdoors by others. This may be through educational efforts, environmental stewardship, resource rehabilitation, protection or preservation, or conservation. The award is intended to support environmental protection and inspire individuals to benefit Vermont’s environment. Vermonters of any age may be nominated. For a nomination application and more information, visit www.greenmountainpower.com. Green Mountain Power serves approximately 265,000 customers in Vermont. In 2014, Vote Solar named GMP a Solar Champion.